How many jobs does it take to create one unit of apartment demand? 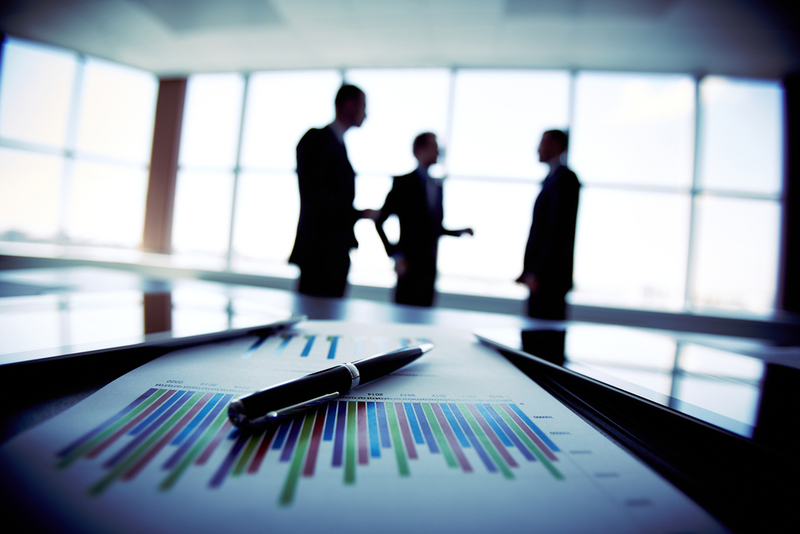 It’s a common question many investors want answered before pursuing a deal. 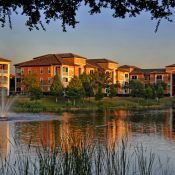 The jobs-to-demand ratio has become a staple of nearly every apartment investment package, a standard metric alongside cap rate and rent growth. But can the jobs-to-demand ratio, viewed alone, do what it’s intended to do – predict future apartment absorption? Not at all. Not even as a back-of-the-napkin, ballpark estimator. Its track record is surprisingly bad. MPF Research extensively examined the relationship over the last 14 years using what is believed to be the industry’s largest apartment dataset. 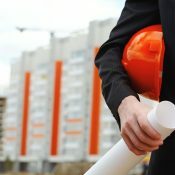 MPF used a variety of techniques, from simple correlations to sophisticated econometric analysis.The results proved that while job growth most definitely impacts apartment absorption, the level of impact can differ dramatically – from period to period and from market to market. In other words, no static jobs-to-demand ratio exists. Nationally, the ratio (annual job growth / annual net absorption) for the combined core 50 markets has varied enormously, ranging between -161 jobs per unit of demand to +130 jobs per unit of demand. Just in this current cycle of strong apartment demand since the start of 2010, the ratio has ranged from -7 to +17. The variation is even greater when looking at individual metros. Here’s an example of just how poorly the jobs-to-demand ratio performs. In Dallas, for instance, the 14-year average measures 4.9 jobs per unit of absorption. If you used that ratio to forecast Dallas absorption in 2014, your forecast would have been off by 7,800 units – or 39.8% — and that’s assuming you nailed the jobs forecast. If you thought it’d be safer to assume Dallas’ 2013 jobs-to-demand ratio of 4.4 would carry over through 2014, you’d end up in even worse shape – off more than 10,000 units, or 46.2%. If you used the three-year average of 5.4, you’d be a bit closer – off “only” 6,200 units, or 34.6%. Dallas is just one example, but you’d find equally wild results in markets of every size and geography. 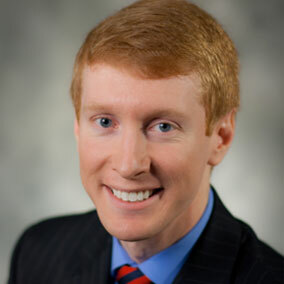 You might expect the ratio to have more value as a longer-term tool, smoothing out noise. But that doesn’t work, either, even at a national level. 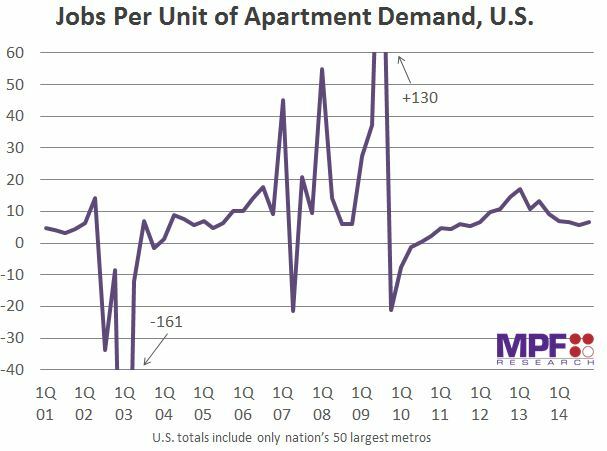 Between 2004 and 2007 (the previous up-cycle), the U.S. averaged 9.8 jobs per unit of apartment demand. If you assumed that relationship persisted in today’s cycle (2010-2014), you’d have woefully undershot actual absorption by 36% – again assuming you had correctly predicted job growth. The above comparison between the 2004-2007 period and the current cycle is helpful in explaining why the jobs-to-demand ratio, considering no other influences, is a horrendous predictor of future absorption. The ratio plunged from 9.8 in the previous up-cycle to just 6.6 in the current cycle. Why? In hindsight, there are some obvious factors – such as homeownership and demographics. More young adults in prime apartment-renting age and more obstacles to buy homes (among many other factors) led to a lower jobs-to-demand ratio. In that way, the jobs-to-demand ratio does have some rear-view mirror value as a useful way to compare cycles. But the factors that shape apartment demand are far too complex than any single variable – even one as important as jobs – can capture. There’s another reason why the jobs-to-demand ratio fails as a rough estimator of future trends. 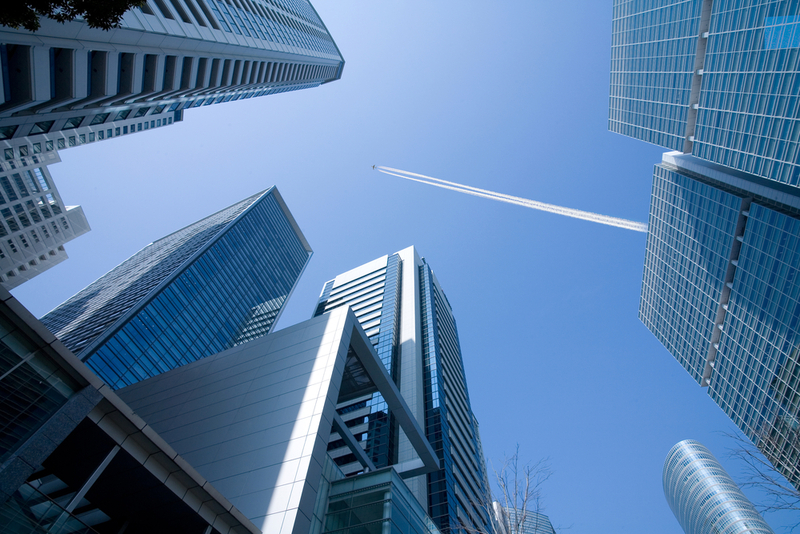 The apartment industry’s traditional demand metric measures absorption of available units. 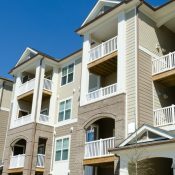 Absorption occurs when a renter leases an apartment unit. That’s one unit absorbed. But that metric doesn’t tell us how many people wanted to rent that same unit. In undersupplied markets like San Francisco, pent-up demand pushes potential demand capacity far beyond actually achievable absorption. Because absorption depends not only on tailwinds like job growth but also on the availability of units, the ratio is heavily skewed. Put another way: New supply doesn’t create demand, but it does create absorption capacity. In recent years, the jobs-to-demand ratio jumped up in 2012 with little new supply hitting the market. And then as new supply began arriving in 2013 and 2014, the ratio went down, thanks largely to increased availability. What can we learn from this? Well, there’s clearly a major flaw in the common practice of comparing jobs-to-demand ratios between markets to help inform investment or development decisions. Case in point: Over the last 14 years, Las Vegas has averaged less than 2 jobs per unit of absorption. San Francisco, though, averaged nearly 17 jobs per unit. The jobs-to-demand ratio’s logic would suggest Las Vegas is a safer development bet because fewer jobs are required to achieve absorption. Is that a sellable narrative? Of course not. Unique factors in both markets make such a comparison ridiculous. San Francisco, of course, has chronically lower vacancy rates due to an undersupply of housing. And in Las Vegas, condo conversions in the mid-2000s turned absorption negative during the mid-2000s, which lowered Sin City’s jobs-to-demand ratio. For those of you more statistically minded, let’s walk through three different econometric techniques to examine the jobs-to-absorption relationship in more depth. 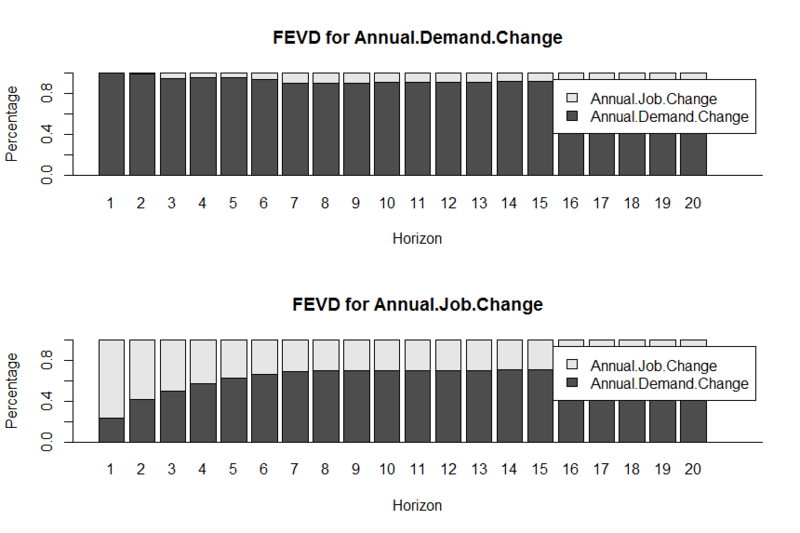 The model determined to lag annual job change one period, and the resulting coefficient for annual job was .07; meaning that for every 100 jobs created, 7 units of apartment demand are generated. That’s a statistically significant coefficient, confirming there’s clearly a strong general relationship between jobs and absorption. But the model also tells us it’d be a mistake simply to plug that ratio into the forecast. 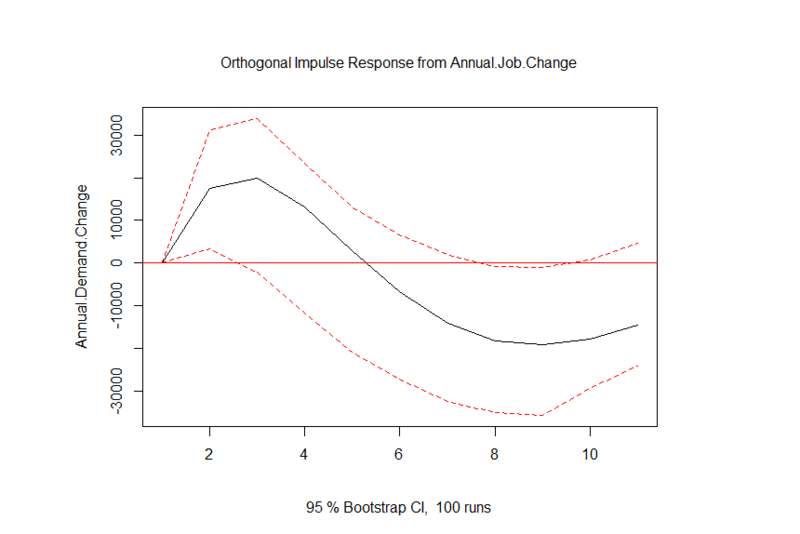 The vector autoregressive model goes beyond the coefficient to show us that it is 95% confident that the jobs-to-demand ratio is somewhere between 8/1 and 50/1. Not exactly a helpful range. This chart illustrates that point, with very wide 95% confidence bands – shown in the dark-shaded gradients. The wide bands indicate just how incredibly imprecise jobs are as a predictor of absorption. Looking at the impulse response function, it is again apparent that job growth affects apartment demand positively, but again the confidence intervals (shown in the dotted red lines) are wide. 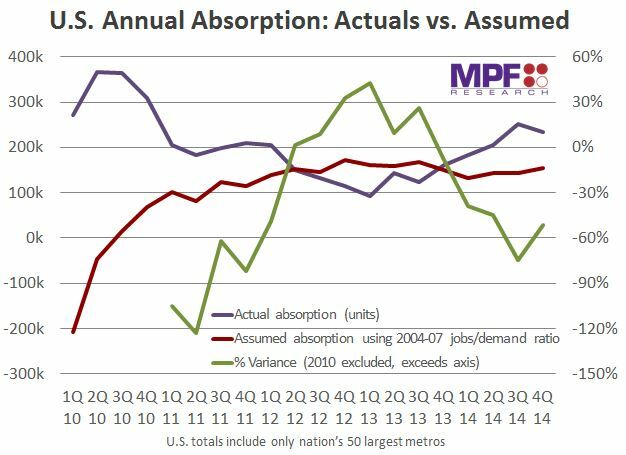 In other words, if job growth rapidly accelerates, the impact on apartment absorption could be minuscule … or it could be massive. Now let’s look at one final statistical test. The forecast error variance decomposition is what its name implies. It’s a measure of how much one variable informs another – or, more technically, how much of the forecast error variance of one variable can be explained by shocks in another variable. This chart shows us that a very low proportion of the forecast error variance can be explained by exogenous shocks to annual job change. In other words, it’s confirming that absorption cannot be oversimplified as a response to job change. The problem here is that the model is, in technical terms, misspecified. There are obviously other variables that influence the absorption of apartments. All three of these techniques are sophisticated econometric tools, and all three suggest that while jobs certainly impact apartment absorption, the relationship is complex. Even as a ballpark estimator, the jobs-to-demand ratio is completely unreliable. 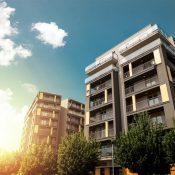 Much more is required to adequately predict apartment absorption. More variables – such as household income, price and availability of substitutes, rental rates, demographic composition, apartment product availability and supply (just to name a few) are needed. Furthermore, those variables can differ from market to market. Few would argue, for instance, that New York and San Antonio share many common demand drivers. So why should they share the same forecast model? 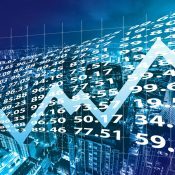 MPF Research’s five-year forecast models are market-specific, using machine-learning tools to sift through billions of scenarios to identify the most appropriate combination of variables unique to any given market. 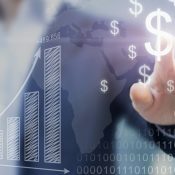 That doesn’t strip away the human element but informs it – which is particularly helpful in advancing us past conventional wisdom and into better tools to make smarter investment decisions.